28-Year-Old And Wife Killed In Horrific St. Lucie County Crash | Schuler, Halvorson, Weisser, Zoeller & Overbeck P.A. 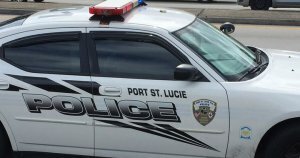 A 28-year-old man and his 35-year-old wife were killed when a stolen Lexus, driven by two teens, ploughed into their car at the intersection of River Park and Lakewood Park Rd in St. Lucie County. The pair had been married for just over a year. Police officials say, the under age driver of the Lexus ran a red light at dangerous speed while driving southbound on River Park Rd. It’s believed the male victim in car was killed on impact. His wife, who was driving, was taken to hospital but died a short time later. The two teenagers, who police believe stole the 4WD Lexus during a home invasion, remained at the crash scene, until FHP arrived. The shocked parents of the male passenger comforted each other while they took in the horrific scene. The pair spent 20 minutes on Lakewood Park trying to come to terms with what had happened. An acting Superintendent said, speaking to the man’s parents was one of the hardest things he had done in his career. “I’ve had to stand at the intersection with the parents of one of the deceased. I’ve been able to explain how it has occurred but not why”.